HARRISBURG, Pa. (EYT) – Many Pennsylvania workers rallied at the state capitol on Thursday in support of a minimum wage increase. Governor Wolf is one person that they do not need to sway on the issue. Wolf spoke in support of those rallying in a statement that reiterated his support for increasing the minimum wage for Pennsylvania workers. Governor Wolf’s proposal calls for a minimum wage increase from $7.25 per hour to $12 per hour before eventually raising it to $15 per hour by 2024. The measure also calls for an increased wage for tipped employees of $12 per hours. 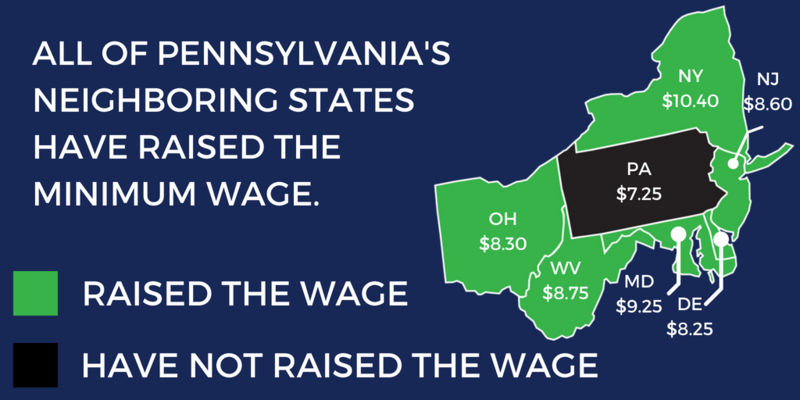 Those employees currently make $2.83 per hour across the Keystone State. While Wolf has obviously had no problem garnering support from his fellow Democrats in the state legislature, most of the Republicans have balked at the idea. They instead argued that increasing the minimum wage would be more detrimental to Pennsylvania workers than it would be beneficial. House Majority Leader, David Reed, recently spoke about his opposition to the increase. His main concern is the effect it would have on individuals being pushed out of the workforce as employers would find ways to offset the costs of increase pay to their employees. Reed went on to explain that it is more important for minimum wage workers to gain valuable working experience and then pursue higher paying jobs. This, Reed argues, will have more of an impact than “artificially” raising the minimum wage. Reed and other Republicans are more concerned about Pennsylvania’s unemployment rate which has approached nearly five percent in 2018. This, they agree, is a bigger issue than raising the minimum wage. Most legislators to the right contend that raising the minimum wage in a way that Governor Wolf is calling for will only make the unemployment issue worse as businesses will adapt to the increased pay by cutting workers. Not all Republicans, however, are completely opposed to a minimum wage increase. Gubernatorial candidate and Senator, Scott Wagner, has gone on record as saying that an increase is needed. His increase, however, would not be as large as what Wolf is calling for as Wagner proposed legislation last year that called for an $8.75 per hour minimum wage. Although Pennsylvania remains the lowest of all of its neighbors when it comes to minimum wage pay, they are not alone at the $7.25 mark. Twenty-one other states also currently impose a $7.25 per hour minimum wage.